Time for some more writing prompts! My 6-year-old LOVES writing but still usually needs some inspiration for what to write and a lot of help with how to spell individual words, so this simple format is perfect for her. Thanks to the different variations with different levels of support, it works for a wide variety of abilities. 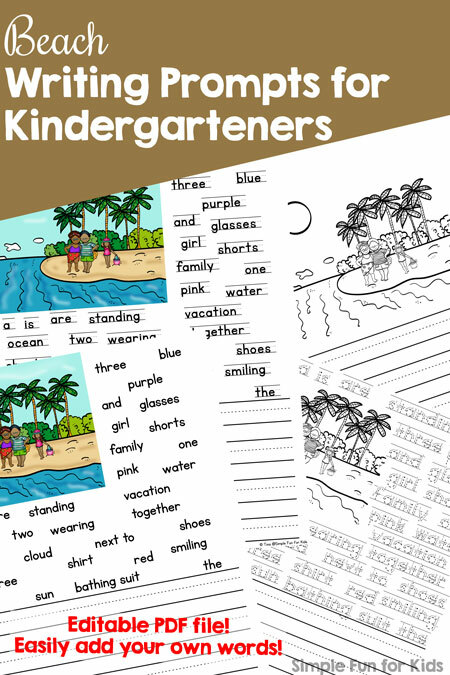 These Beach Writing Prompts for Kindergarteners are perfect for the end of the year, to get ready for summer or to use in the summer to fend off some of the dreaded summer slide. The file includes three different variations of beach-themed writing prompts with colored or black and white image prompts and word prompts in different fonts (a lined traceable font with arrows and numbers, a solid lined font, and an unlined font). There’s also a variation with no word prompts. Finally, the fifth variation is editable, so you can add your own words easily. Unless you want to use your own words, you don’t need any special preparations, simply print the page(s) you want to use and let the kids get to writing. 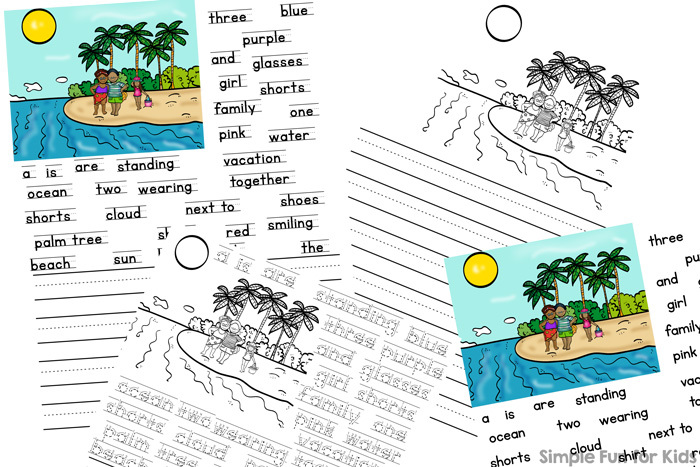 Download your Beach Writing Prompts for Kindergarteners! Become a VIP member today and download this and hundreds of other printables with one click, get a 50% VIP discount, and more! Are you looking for more writing prompts? Here are a few others!